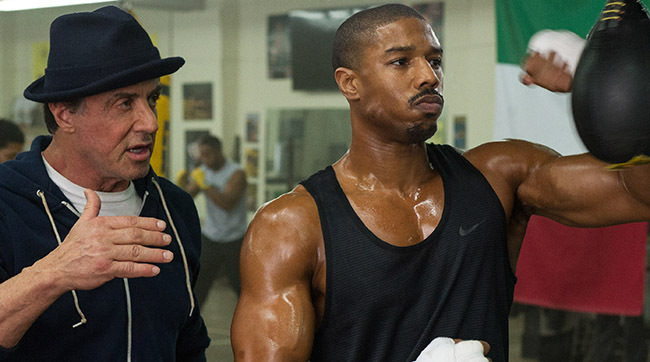 ​A few weeks ago, I went to see the film Creed. It’s a kind of sequel to the Rocky movies, but this one focused on Adonis Creed, the son of Rocky’s nemesis Apollo Creed. The movie is great, and as I sat engrossed in the theater I began thinking about the ancient history of boxing and its popularity over the last three millennia. The names “Apollo” and “Adonis” harken back to Greek mythology and the classical world. But it was more than that. The whip-smart approach of Adonis Creed himself reminded me of Greco-Roman boxers. Painted frescoes from earlier Minoan civilization (a Greek society from around 3650 BCE to around 1450 BCE) may depict young men engaged in boxing matches. But the first literary mention of boxing comes from the funeral games for Patroclus described in Homer’s Iliad. While the poem discusses the Trojan War that occurred around 1100 BCE, Homer recited the epic tale sometime around the eighth century BCE. The prize for the victor of the boxing match was a mule, which emphasized the trait of steadfastness. Boxing was also enjoyed by the ancient gods. The patron god of the sport was Apollo, the son of Zeus and Leto. It was said that he defeated Ares, the god of War, in a boxing match during the first Olympics. Apollo had also beat Hermes in a footrace, so we know he had quick feet. ​​The first mortal Olympic boxer appears to have been Onomastus of Smyrna. 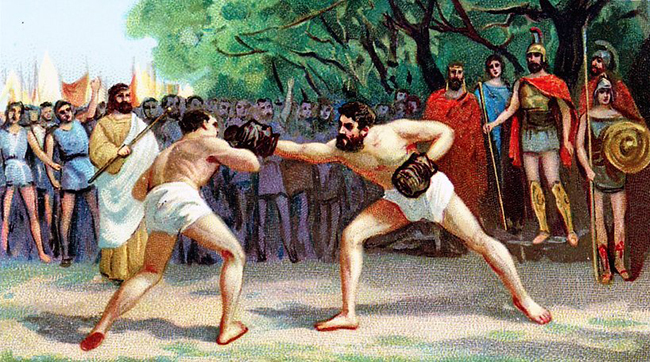 In 688 BCE, boxing officially became part of the Olympics. Unlike modern boxing, there was no ring with ropes (just a pit area with loose earth) and no system of rounds. But there were officials with sticks to keep order and enforce rules against holding, biting, and scratching until the loser signaled concession with a raised index finger. There were no weight classes in ancient boxing. So endurance, a nimble mind, and quick footwork were essential if a small boxer wanted to defeat a larger one. Greeks valued and indeed competed in self control, both in battle and in athletics. A first century CE boxer named Melancomas reportedly had a two-day match. He simply bobbed, weaved, and avoided his opponent until he eventually claimed victory over his tired opponent. Victory by exhaustion was not a disreputable way to win. Far from it! Equipment was also minimal in ancient times. 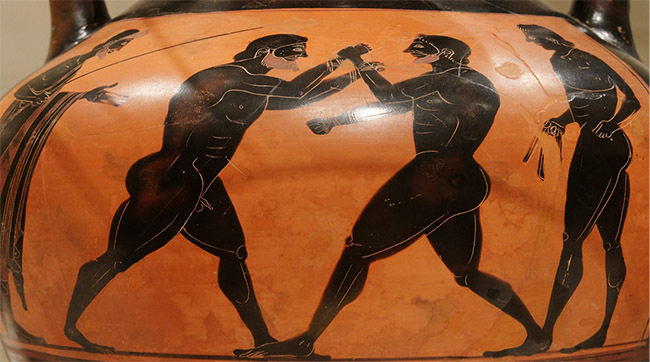 The early Greek boxers usually tied strips of leather around their hands and knuckles. There were softer practice gloves used to spar with and ear guards for day-to-day protection. Boxers trained using a punching bag called a korykos that was found in a special room of the gymnasium, where Greek athletes and other citizens went to exercise both their minds and their bodies. Eventually, more padded — and heavier — gloves came into use. During the Roman period, a new type of glove called the caestus became popular. Many alleged that metal and even glass was loaded into these gloves in order to pack a more severe punch. Like today, ancient boxers wore evidence of their matches on their faces. Bruises, scrapes, scars, swollen ears, and misshapen noses were all physical records of their bouts. One boxer supposedly had his teeth knocked out. He swallowed them so that his opponent wouldn’t know. A satirical writer named Lucilius tells the story of a boxer who was so badly beaten that he could not claim his inheritance. Ancient fighters surely experienced the effects of concussions, too. But these types of mental injuries weren’t known to doctors in the classical world. ​​Boxing remained a popular sport into the Roman era. It was a favorite of the emperor Augustus and a mainstay of many athletic competitions, even amid the rise in popularity of the pankration and gladiatorial combat. (The pankration was an intense mix of boxing and wrestling similar to the modern UFC.) Perhaps one reason for the popularity of boxing — then and now — is that it serves as both a model and metaphor for life. This is one reason that even biblical texts used the language of boxing and athletics in order to convey struggle. Much like an ancient boxing match, life is about skill, training, self-control, and commitment to a task. Trophies, statues, and artistic depictions of boxers in the ancient world inspired kids and adults in classical times. Thousands of years later, fighters are still providing inspiration — in films featuring heroic boxers like Rocky and Adonis Creed. Sarah Bond is an Assistant Professor of Classics at the University of Iowa. She loves baseball before all other sports.